We lost another great one. In the past nine days, David Bowie’s death has been written about and talked about everywhere. I wonder if my kids will remember this death like my Mom remembers the death of Lennon or I remember the death of Cobain. They might not be ‘fans’ but they might hear ‘China Girl’ and remember their Mom singing it at the top of her lungs or hear ‘Ground Control’ and remember their Dad couldn’t listen to the Chris Hatfield version b/c it couldn’t hold a candle to Bowie’s version. It is also possible that they might not remember it at all. But they will have their own Bowie’s. They will have their own music to get lost and caught up in. Because really, that is all we can ask of great art – that we are drawn in and, for a moment, make ‘contact’. 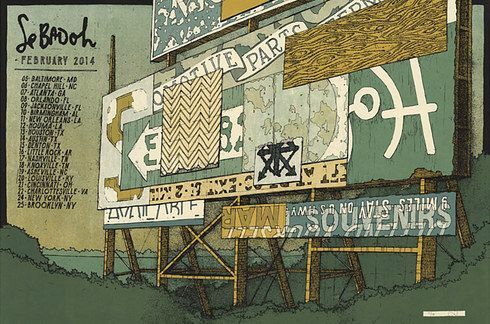 So for the fans of music and art alike, here is a group show of wonderfully amazing music gig posters.